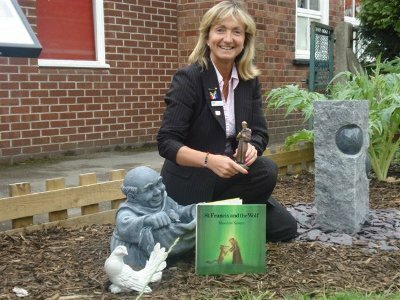 Since Woodheys Primary School in Cheshire England became one of the first Peace Mala Accredited schools in the UK, Headteacher Laura Daniels continues to draw attention to the excellent Peace Mala work taking place at her school. Pam Evans, Founder of Peace Mala, has visited the school on three occasions and always finds it a great joy to be with pupils and staff who understand and believe in the global vision of the Peace Mala project. A chance encounter with Pam Evans brought me into the world of Peace Mala ®, a symbolic double rainbow bracelet and project for World Peace devised by Pam after the 9/11 terrorist events in the USA. The project encourages youngsters to make and wear a Peace Mala and engage in creative projects that interpret its vision. From the moment I laid eyes on the Peace Mala bracelet, I knew that this was something very special, the missing link in education, the 'glue' that would bring together everything that we, as educators of tomorrow's Global Citizens are striving for. At Woodheys Primary School, due to our internationally recognised environmental work, we were asked by the Development Education Project (DEP) to endorse an innovative training tool for teachers around the 'Global Dimension' curriculum. The ethical messages which are needed to fully understand Conflict Resolution, Human Rights, Social Justice, Interdependence, Diversity, Values and Perceptions are all incorporated within the Peace Mala vision for the world. Due to our Interfaith Community Cohesion projects, e.g. our Labyrinth, the school has won the joint Junior Peace Mala International Award for Youth 2008. Following this award, I volunteered to join the team and help promote Peace Mala on an international level and with its integration into education. This has been met with the approval of Pam Evans (founder and creator of Peace Mala) and the Board of Directors of the Peace Mala charity. 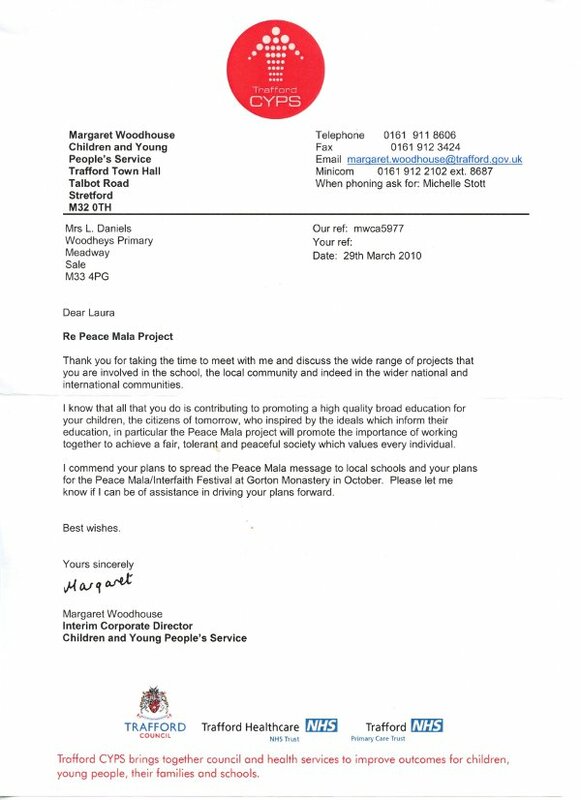 In September 2009 we became one of the first three schools in the country to receive Peace Mala School Accreditation. 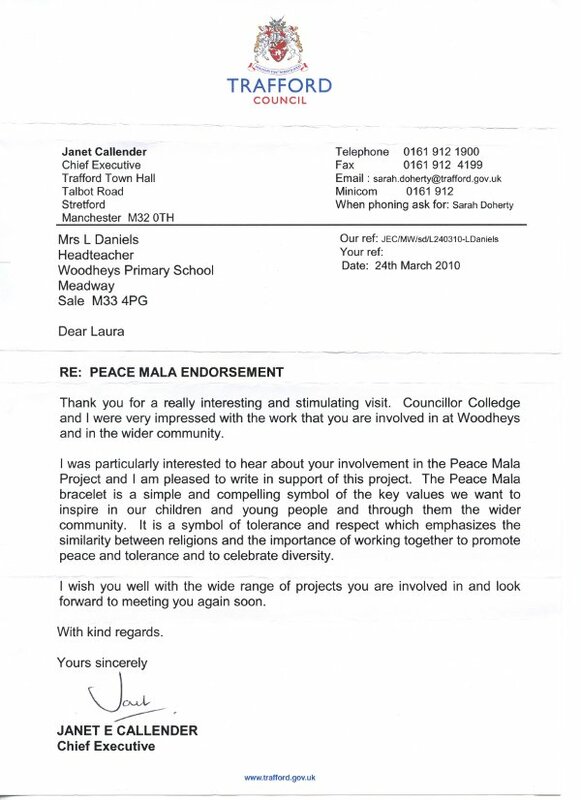 On 4th October 2010 the very first Peace Mala Festival of Inter-Faith and Education for Culture took place at The Monastery Gorton Manchester and was organised and directed by Laura Daniels. Terry Waite was the guest of honour and main speaker. The day proved to be a wonderful success and will be remembered by all who attended it for the rest of their lives.